Prosody is an XMPP server; for most people and most uses, that means it’s an instant messaging server that anyone can run, and talk to anyone with an account on any other XMPP server. So unlike centralized chat platforms like WhatsApp or Facebook Messenger, you don’t have to trust a single big company to run it and to not misuse your data. I’m focusing on Prosody here because I run a Prosody server, and in my experience it’s easier to set up and run than others. Conversations is an easy to use, but full-featured XMPP client (chat app) for Android, which adds a lot of capabilities that older clients haven’t had. It has all the features you’d expect from a mobile messaging application, like message history, sending images, videos, etc., low battery use, multi-user chat rooms, and simple end-to-end encryption. This is great. It means there’s a federated end-to-end encrypted messenger that is as easy and fun to use as Signal or WhatsApp. The not-so-great: XMPP is a modular standard, which means that not every server and not every client will implement all of the same parts. Conversations, being a new client that offers a lot of new features, also makes a lot of demands on the server. There are a lot of modules (called XEPs) that it needs that most servers don’t implement, or don’t have turned on by default. You don’t need to install your own XMPP server to use Conversations — just sign up on an existing one; they even provide a default. This guide is for if you want to run your own for yourself, your family, and your friends. It’s not terribly hard to get Prosody to support all of these XEPs, but it does take a little bit of work and digging. I’m going to save you the digging part. Your system may use, e.g., apt-get or pacman to do the same thing. You should refer to the Prosody setup docs for basic configuration. The main things you need to configure are the host you will be serving on, and your encryption certificates. Self-signed certificates may be good enough, but I’m using Let’s Encrypt. Once you have Prosody set up basically, you will be able to connect with Conversations, and do basic chats, either one on one or multi-user. A lot of things won’t work, though, like OMEMO encryption, which is what you want to be using. The first step is enabling modules that are bundled with Prosody, but which aren’t enabled by default. You’ll need to look in your /etc/prosody/prosody.cfg.lua (or wherever your config file was installed). The defaults look like this on Fedora; they may be different on your system. Double hyphens are comments. -- This is the list of modules Prosody will load on startup. -- It looks for mod_modulename.lua in the plugins folder, so make sure that exists too. This gets you a lot of the way there. At this point, most things in Conversations will work, including OMEMO encryption, and message syncing between devices. Offline delivery will work sort of, but you may see oddities like duplicate messages. The remaining modules you need are included in a community repository. You’ll have to use Mercurial to clone the repository. If not everything is checked, you should go back over the list of modules and make sure that you’ve installed all the modules you need. One widespread criticism of XMPP/Jabber and an excuse for its lack of wider adoption is that there are too many modules to the standard to guarantee compatibility between clients and servers. But it doesn’t have to be so hard. 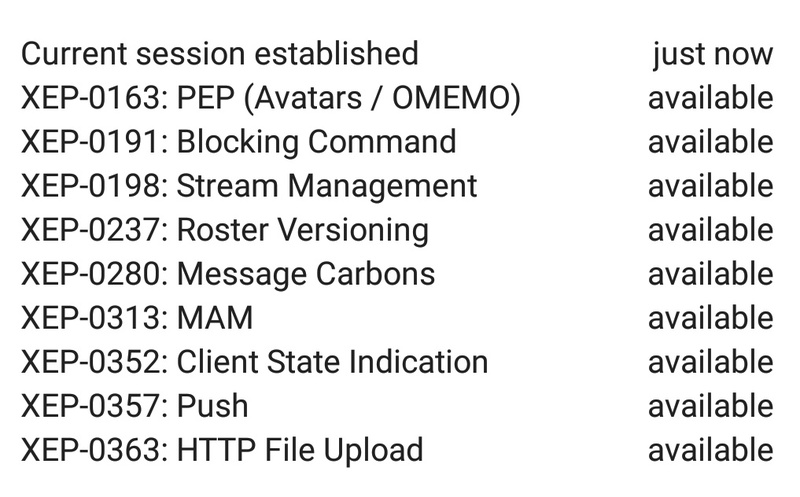 You can take Conversations’ requirements as the baseline for what an XMPP server needs to support in 2018, and make sure your server supports those things. Many thanks to everyone working on Conversations and Prosody, including those working on the Prosody community modules.